(partial) Section headings and selected papers: Foreword. Aspects of Magnesium Technology. Production and applications of ultra high purity magnesium, S G Hibbins & F C Dimayuga. Magnesium plaster cast prototypes versus die castings - a comparative evaluation of properties, N Fantetti et al. Low pressure casting of magnesium alloys, J C Hogg et al. Light Metal Matrix Composites. Ultimate sediment distribution in unidirectionally cast AlSi-SiC particulate metal matrix composites, M Gallerneault et al. On the wettability of ceramic fibres by metals in various metal matrix composite systems, H Liu et al. Microstructure/property relationships in SiCp reinforced aluminum composites, S Dionne & M R Krishnadev. 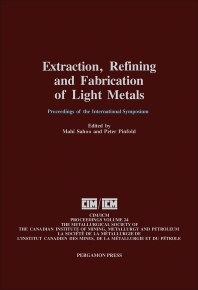 Aspects of Light Metals Reduction Technology. Cathode heat flux measurements, N E Richards et al. Strontium extraction by aluminothermic reduction, J Langlais & R Harris. Recovery of cryolite from spent potlining of Al reduction cells by flotation method, Zhai Xiujing & Qui Zhuxian. Casting and Solidification of Aluminum Base Alloys. Vacuum casting of aluminum alloys, J L Dion & M Sahoo. An experimental study of twin-roll casting, D V Edmunds et al. Mathematical Modelling and Computer Simulation. Finite element method in die filling simulation of non-ferrous industrial castings, D Frayce et al. 3D-simulation of the thermal performance of the coke calcining kiln, R T Bui et al. Melting, Alloying and Properties of Light Metals. Enhanced corrosion resistance in Al-Zn-Mg-Cu Alloys, R C Dorward. Scrap melting and metallurgical processes employed in aluminum recycling, D V Neff. Authors' index. Keywords index. World-class scientists and engineers from more than six countries presented thirty-five papers on topics such as magnesium casting technology, metal matrix composites, mathematical modelling, solidification and reduction of light metals. Metal matrix composites are an important class of advanced industrial materials and significant advances have been achieved recently on the fabrication and characterization of their microstructures and mechanical properties. For materials scientists and metallurgists.